Manufactured by Drive DeVilbiss Healthcare, the Sport Rider is a modern looking scooter that borrows technology from the motorcycle industry. It comes with all-round suspension and telescopic front motorbike suspension as standard and has a top speed of 8mph. The throttle lever includes an automatic safe-braking system and there’s an additional handbrake for added security, whilst the illuminated controls feature a twin dial digital dash and a trip computer with odometer that measures the distance travelled. The seat comes with a sliding and reclining facility, while the headrest and arms can be adjusted to suit the user. All-round lighting, including a large headlight, front and rear indicators and rear brake lights, are designed to ensure high outdoor visibility. The front wheel drive Titan from Drive DeVilbiss Healthcare is designed for indoor and outdoor use. The controller mount is length adjustable and the backrest folds for storage and transportation. Featuring padded upholstery and a height adjustable reclining seat that swivels to aid transfers on and off the chair, the detachable armrests and flip-up footplate are both height adjustable. Front tip wheels are fitted as standard and the solid non-marking tyres are designed to be low maintenance and provide durability. It features de-clutch operation and a Dynamic Shark programmable controller. The Titan Powerchair has a maximum speed of 4mph and a range of up to 19miles on a full battery charge. 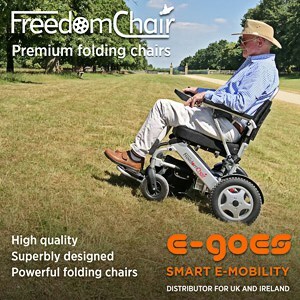 The folding i-Go electric wheelchair from Pride Mobility is designed to fit into small spaces. Standard features include built-in front suspension, a durable padded seat with storage space and a flip up foot platform. It can reach a maximum speed of 3.7mph with a maximum range of 6.2miles. The Edge 3 from Quantum boasts an upgraded Smooth Ride Suspension (SRS). Optional iLevel is available at 4.5mph, with up to 12 inches of power adjustable seat. Long life front and rear LED fender lights, mounted above each drive tyre, are fitted as standard. A USB charger and drive wheel colour accents are also included. The Edge 3 comes in 14 colour options, with an addition of seven new colours. Launched at the end of 2018, the LuggieChair is the latest addition to the Luggie mobility scooter range. This foldable scooter has been designed to be compact and lightweight and includes a wide footplate, wide padded seat, adjustable armrests and a controller which can be fitted on either side. Roma Medical’s Shoprider Sovereign 4 scooter can travel up to 20miles per charge. Features include an automatic braking system, five position angle tiller, direct drive sealed transmission/gearbox, freewheeling device and an off-board charger. There’s a detachable fold-down, lockable four position padded swivel seat with forward, back and height adjustment and angle adjustable fold down arms. Finished in red, the Sovereign 4 is fitted out with a chrome front bumper, headlights and side reflectors. The scooter dismantles for transport and storage.